The Human Rights Campaign, the American LGBTQ civil rights organisation, celebrated an election victory in Anchorage, Alaska, where voters soundly rejected Proposition 1 – a dangerous ballot measure that sought to eliminate existing municipal non-discrimination protections for transgender people. The ballot measure would have also enshrined discrimination into law, by forcing transgender people to use facilities that are inconsistent with their gender identity. HRC serves on the Executive Committee for Fair Anchorage, a coalition that includes local organizations such as ACLU of Alaska, Planned Parenthood of the Great Northwest and Hawaiian Islands, Alaskans Together for Equality, Identity, and Pride Foundation. HRC worked with Fair Anchorage to uphold the city’s LGBTQ non-discrimination ordinance, and had field staff working on the ground with the campaign to mobilise opposition to Proposition 1, and elevate transgender voices and stories in the fight for equality. said HRC President Chad Griffin. 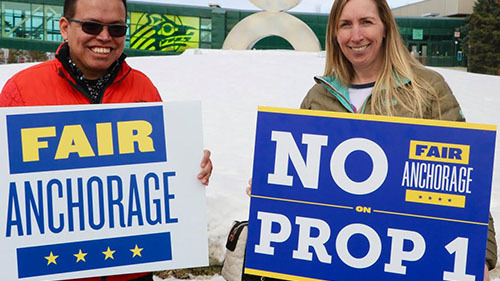 HRC President, Chad Griffin, was on the ground in Anchorage to support local coalition efforts. Griffin met with local transgender residents, other community advocates, and HRC Anchorage members, whose lives would be negatively impacted by the dangerous proposition, including David and Col Lockard, a father and his transgender teenage son who have spoken out in campaign ads against Proposition 1. Griffin also met with Anchorage Mayor Ethan Berkowitz, who signed the city’s LGBTQ-inclusive nondiscrimination ordinance into law in 2015, and with other Anchorage residents.